Tenjin-Dori is a street in Nagaokakyo city, Kyoto prefecture, Japan. It runs from just outside the west exit of JR Nagaokakyo station to the main torii gate of Nagaoka Tenmangu Shrine. 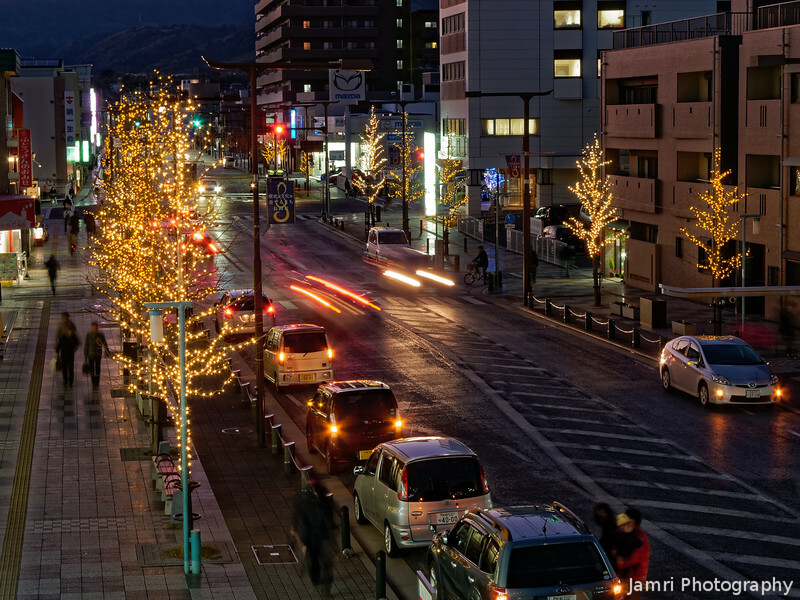 During the Bambio Illumination the trees near the JR Nagaokakyo Station on Tenjin-Dori are covered in lights. This photo was taken with a Nikon Coolpix P7100 mounted on a tripod. It was captured as a RAW (.NRW file) and post processed in DxO Optics Pro. I also made a youtube video of this event. Really nice night shot - love the "streaks" and the well-defined illumination of the vehicles' headlights and taillights!